Retired Air Force Col. John Marselus, associate dean of the unmanned aerial systems (UAS) program and former A-10 Thunderbolt II and F-15E Strike Eagle fighter pilot, is currently the only School of Aeronautics (SOA) staff member in charge of the infant UAS program. Designed to train future unmanned aerial vehicle (UAV) operators, the new degree program is taking off faster than anticipated. However, Marselus also called himself something that contrasts the image of the great and powerful lord of the Emerald City. According to Marselus, the program officially taxied to the runway a year and a half ago after it was found that UAV technology was here to stay. At its beginning, Marselus was able to speak with industry leaders and explain to them the hopes and goals for graduates of the program asking them what they were looking for in potential hires. After hearing the vision, industry leaders told Marselus they would be thrilled to help. “We’ve had Cloud Cap Technology giving us 90 percent off their software products, and in addition providing our program with information technology expertise at no cost, and their documents, all of them, at no cost,” Marselus said. Marselus went on to explain how Textron provided software, command and control expertise and invaluable teaching services to him at no cost. Textron also sent instructors to help develop and teach a UAS course giving students the very latest in industry curriculum at no cost. According to Marselus, another industry partner that is helping extensively is UAV Pro. UAV Pro offered their program and its many documents on UAV training and technology. UAV Pro has also let the UAS program house its simulators, ground control stations, and aircraft at the SOA facility. According to Marselus, come this football season, Liberty University will have its own blimp in the form of a Cessna 172 with a TASE 300 pod on it. Cloud Cap Technology donated two TASE 300 pods that normally cost $90,000. UAV Pro is helping develop the ground control station that will allow an operator on the ground to utilize the pod while fitted on a Cessna 172 in the air. According to Marselus, the pilot of the Cessna 172 does not have to even touch the targeting pod. The vision is for the operator on the ground to forward the live feed from the TASE 300 pod to Liberty Flames Sports Network (LFSN), which can go on TV screens and on the Williams Stadium Jumbotron, much like a blimp. Marselus also spoke of a partnership opportunity shared with Virginia Tech, University of Maryland and Rutgers University during a Federal Aviation Administration (FAA) selection phase to choose six UAS test sites. During the selection phase, Marselus was able to help the state universities because of Liberty’s aviation expertise, according to Marselus. According to an FAA news release, the selection process spanned 10 months that included 25 proposals from 24 states. Factors involved included geography, landscape, safety and airspace use. Marselus had the opportunity to talk with Ken Isaacs, vice president of programs and government relations for Samaritan’s Purse. Through key connections associated with the UAS program, Marselus was able to connect the Samaritan’s Purse executive with Jim Hill, president of Aircover, a company that excels in UAS technology. Jim Hill offered Samaritan’s Purse a UAV and an operator at no cost to Samaritan’s Purse Disaster Assistance Relief Team (DART) operations. Now, when a DART team touches down in a disaster relief area, they will be able to launch a UAV to map out the area and conduct surveillance of the affected region to obtain almost immediate situational awareness. Norman Khan, a student pursuing a degree in the UAS program, appreciated the opportunities he is able to take advantage of while undergoing his studies. Marselus highlighted the fact that students graduating from the degree program have been able to secure jobs with industry leaders with a six figure starting salary. Khan underscored an opportunity he and fellow classmates had with a state-of-the-art aircraft. According to Marselus, the UAS program at Liberty requires a student to complete his or her private pilot license as well as an instrument rating. Nationally, UAV operators are generally not required to complete an instrument rating. By completing an instrument rating, the advanced certification allows Liberty graduates to be more competitive in the job hunt. Safety is another top concern for the UAS program. Concerning the actual operation of the UAV, Liberty’s partnership with the test sites shared with Virginia Tech, University of Maryland and Rutgers University will allow them to operate UAVs. 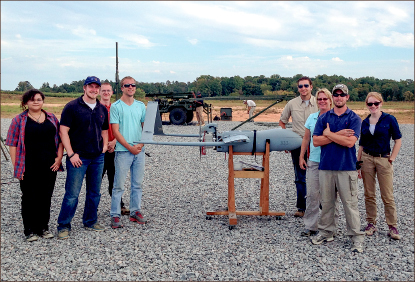 Being in this partnership gives Liberty the opportunity to be at the forefront of UAV technologies and operations. Marselus also touched on the impact of UAV operations on privacy. ability that UAVs bring to the table. “I don’t believe UAVs are necessarily the future, but they certainly are a major part of the future of aviation, and regardless of people’s opinions, they’re here to stay,” Marselus said. VAN DYK is the news editor. Thanks for this article, it made me learn a lot about law!